Chon Ju Jip - Not for the faint of hearts! "Hi! This is Vicky posting about her latest meal. She is extremely honored to be invited by Kirk to blog on mmm-Yoso!" H and I stopped in Chon Ju Jip on Convoy last night to finally try out this restaurant. It's owned by a lady named Yong Rivers, and we first met her when we ate at Golden Crown in Mira Mesa. She's this funny happy Korean lady that would always call H a camel because of all the water he'd drink while eating spicy Korean food and would proceed to give him a pitcher of water so he could pour his own water. A couple weeks ago, we finally saw Yong at Golden Crown again and told her we missed her when we found out that she had left Golden Crown and was now venturing out and opening her own restaurant on Convoy. We promised her we'd visit and try it out and after some hugs, we went out seperate ways. While Golden Crown (for a later post) is a wonderful Korean restaurant for Korean food with a Chinese influence, Chon Ju Jip was strictly Korean food by itself. It was as Korean as it could get. It's located in the same strip mall as Convoy Tofu House and Thai House. When we got there, there was a slight wait since all the tables were taken. I took that opportunity to survey everyone's dishes and the panchan. It looked pretty promising. We got seated and opened up the menu... Unfortunately half of the menu was in Korean with no translation so we had Yong briefly go over it. I ended up ordering the "Oh Jing Uh Bok Kum" and H ordered the "Kimchi Chige." Service was prompt and polite, cups of iced barley tea was brought out along with the assortment of panchan. They had a large assortment in these pretty little dishes. The napa kimchi was perfectly tangy - just sour enough to make my mouth water. My favorite was mushroom stirfry panchan (in the far left corner... or the one of two dishes that wasn't bright red!) The mushroom medley of oysters and shiitakes were well cooked and flavorful; full of woodsy earth tones. The rest of the panchan was very well done, I didn't care as much for the plain daikon half circles floating in the middle. Eater beware though, they are colored red for a reason. Like H said, this place isn't for the faint of hearts. The spicy panchan here really awakes the tastebuds. After grazing through our first round of panchan, my dish arrived. It's a dish of squid/calamari stirfryed with some veggies and a few rice cakes in this spicy red sauce. Unfortunately, the picture didn't turn out as I just found out right now... Bummer! My hands shook as I took it and it's just a big red blob. The dish was flavored with ginger overtones along with the heat from the chili peppers. The calamari was tender and perfectly al dente - I've had many calamari dishes where the chefs cooked it too long and it was like eating a piece of rubber. The calamari here was perfect! The service here was excellent, the servers brough refills of panchan without even having to be asked. 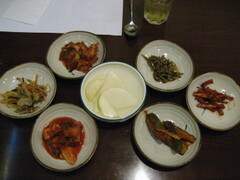 After a refill of mushrooms and the little sardine fish panchan, H's's Kimchi Chige arrived. 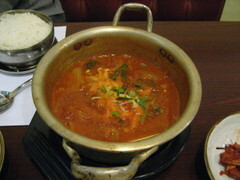 It is a basic stable of pork and kimchi all stewed together with some vegetables. It came while still boiling in this red hot bubbling broth flavorful goodness! The soup was tangy from the kimchi and the pork added some texture. It was topped with a bunch of enoki mushrooms that slowly cooked in. It was warm and satisfying, perfect for a cold night. The only downside is that the heat from the dishes was on the extreme side. H and I usually eat pretty spicy dishes, I'll much my way through a couple jalepenos while I eat my dumplings and the dishes tonight were a pretty close second in terms of spicyness. True to form, Yong gave H his personal pitcher of barley tea. 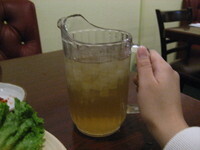 After he finished off the restaurant pitcher sized, she brought him a mini pitcher. So cute! From the looks how how packed the place was, I think Yong's doing well. The food was excellent, the service was great. We were the only non-Korean in there that night, so I'm guessing the restaurant caters to mostly the Korean crowd. I have pictures of the menu that I took so I could get my friend A to tell me the English translations. I'll post that up as soon as I get them so in the future, those who aren't proficient wouldn't do what I had to do; "can I have whatever she's having over there? where's that on the menu?" I'll do a quick short post since Kirk's done a more in depth post on Chopstix Too already. 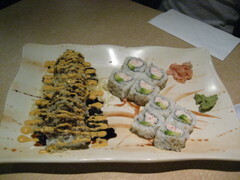 My friends and I have always loved the ramen and crunchy roll at Chopstix. Ever since our days of being poor college freshmen at UCSD, we'd make our weekly trek out there to get the ever so elusive crunchy roll. In fact, my best friend J who moved back up north after we graduated, made a trip to visit me just for a meal at Chopstix. Most weeks, you'd find a bunch of us grubbing here after the gym. I love their combos that are still on "Grand Opening Special." We stopped in earlier this week after running a couple miles at the gym. 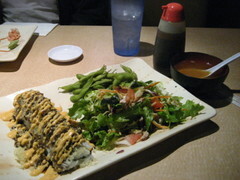 I love the Crunch Roll/Salad/Edamame combo. I get to minimize my carbs and still get a really filling meal. H tried out their California/Crunch Rolls. In the past when we came with our friends A and H, they've ordered the Tonkotsu Ramen which is a bowl of ramen with the milky pork bone soup. That was also really good. The soup had depth and a lot of flavor. Chopstix is out go to place for a bowl of ramen and Chopstix Too is where to go when you can't decide what you want! Where else can you get chicken katsu AND crunchy roll for under $6! 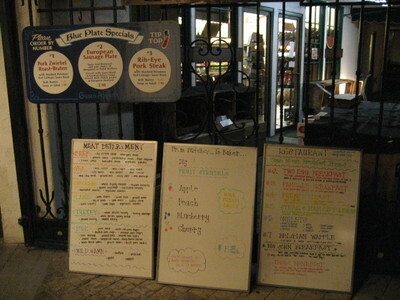 Topping out for Good Eats ~ Tip Top Meats! Wowsers! 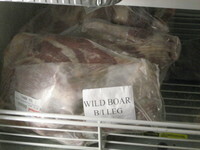 They even have their daily availability of wild game and goodies to satisfy the pickiest inner carnivore. If you look on the bottom right of the corner to see their "Big John" breakfast, its the craziest entree on their breakfast meal. Their menu describes it as: "Three eggs any style, home fried potatoes, toast, and ALL* of our own delicious smokehouse bacon, pork link sausage, or polish sausage, bratwurst, or ham you can eat." *~Sorry, ALL not valid on TOGO orders (two choices of meats). All that for $5.98! S got that one time when we went shopping at the outlets down the street. They weren't kidding about the all you can eat! It seriously was all you can eat meats! Tip Top apparently is a wholesale meat market that some of the high end local restaurants use. They have their deli on the end of the market and apparently their mentality is to cut out the middleman/distributor so their meals stay unbelievably reasonable! AND they give you an amazing portion! AND it's amazingly tasty! A freezer full of random things... (yes if you look at the enlargement, they have "maui ribs..." I haven't quite figured out what Maui Ribs are though... )The scary part of the store is that they have everything fresh in the meat cases AND frozen so it will keep when it travels! How convenient! 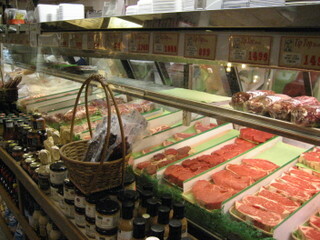 Here's a look at the crazy meat case full of meat. They had nearly every imaginable cut and part of meat. The best part was that the prices were kept very reasonable. At the same time, the staff was very knowledgeable. They had everything from veal cutlets to bacon wrapped filets. The sausages are made in house and the bacon is also smoked in house! Unfortunately when we got there around 7, they had already started covering up and cleaning up so that was the only section of the meat case that wasn't covered up or stored away. In addition to being the ultimate meat market, Tip Top also makes a plethora of European pastries.... including.... STRUDEL! 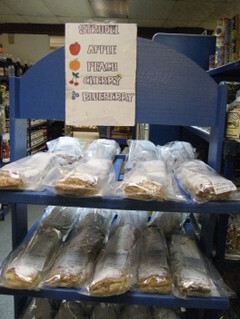 Here's a picture of their gargantuan strudel: avaliable in 4 flavors, which they bake in house. They also make a wide variety of German cakes and goodies. Each strudel was about 7 inches wide and nearly 2 feet long!!! They also carry the strudel cut into manageable serving sizes in the eatery portion. Each strudel will set you back nearly 6 dollars. Goodness... Here are a couple more shots of the marketplace. 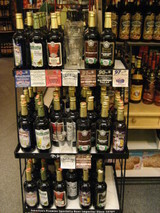 When you have German sausages, you gotta have the German lagers and beers! 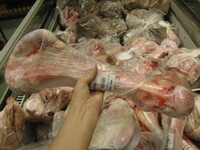 This picture is for Frankie and Sammy... At first, I just took a picture of the bones in the case but realized how there was no way to really see the size of these suckers so I shall present you my very unflattering wrist and thumb! (And yes, there is probably a herd's worth of cow femurs.) Wow... that is ONE huge bone. I'm sure it would make some amazing stock though... Although I don't know anyone who would have a stock pot big enough to cook it in. 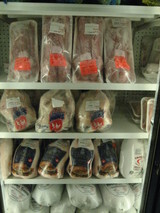 Also available here at Tip Top is a well dressed and re ady to cook Bugs Bunny along with goat. (I recall seeing some comments a co uple days ago from a reader asking about goat availability in San Diego. I'm kinda tempted to ask Tip Top what they DON'T carry. Along with fresh meats and frozen game, the grocery/deli/market had an amazing selection of goodies. 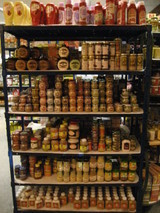 Here's their "condiment" section, full of every single imagineable imported ketchups/horseradish/and mustards... to go with every single imagineable sausage/wurst/link they make! I was amazed at how much stuff they carried! They even had a caviar section of imported caviars from around the world. So after much perusing and browsing and "stealth" picture taking, I joined up with the guys who were patiently standing in line by the eatery. So the eatery pretty much works like this: you stand in line, you tell her what dish you want, choose your sides - one or two sides depending on the dish, salad or soup, and generally it comes with a roll. So the reason for this visit in the first place is that from 4:30 to 8pm every Friday, Saturday, and Sunday, they have prime rib. It's not the meager tough prime rib they serve at the neighborhood buffet place or even the cheap Nevada buffets. I'm talking about the GOOOOOD stuff. I actually prefer the texture of their prime rib over Donavan's! Granted they don't have the white linen tableclothes and it is pretty much a "they call your number" and you get your food and go chow type of place. So we ordered two prime rib plates, which came with 2 sides, soup or salad and a dinner roll. The choices for sides are: mashed potatoes and gravy, baked potato, french fries, sauerkraut, red cabbage, or steamed veggies. I had sauerkraut and mashed potatoes where Cousin H had the veggies and mashed potatoes. We each got a different soup; tonight they had beef barley and lentil. I don't think I enjoyed the soup that much. I'm still trying to get used to thick heavy soups, being that I was brought up on miso shiro and tofu vegetable soup. So we got our soups, and sat down. (H and I were sharing a prime rib plate... hence the two orders. I can never finish an entire plate and I hate dealing with leftovers.) So after a short while, our number was called and we picked up the immense amount of food. So maybe presentation wasn't their forte.... And apologies for the empty soup dish. Also, I had cut a good hunk out of the top piece of prime rib before H reminded me to take pictures. Yes... it was TWO slices of prime rib on each plate! MMMMMMMmmmm! 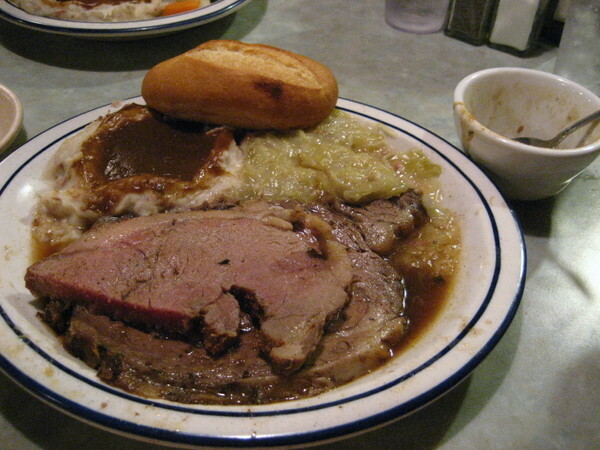 The prime rib was tender and tasty, perfectly medium, swimming in a pool of au jus served with fresh horseradish. (I'm not a fan of horseradish... maybe that's why I forgot to take a picture of it.) It was straight up European home style cooking, the gravy on the mashed potatoes was divine, same with the sauerkraut. It really helped cut whatever fat/grease was in the meal. All that food for 10 dollars and change! Most of the entrees are under 10 dollars. The prime rib roast is probably one of my favorites to get there, they also carry a lot of German style foods including sauerbraten, rouladen, holsteiner schnitzel. They also offer veal cordon bleu for under 8! If none of the entrees tickle your fancy, you can go over to the meat counter, pick out your steak and for an extra 2.98 in addition to the market price of the raw steak, they will cook it to your liking and add in sides for a complete steak dinner. According to their pamphlet, they will order any specialty meat and will cook anything for you provided you give them a three day notice for whole pigs and steamboat rounds. I Scream, You Scream, We All Scream for Curry! "Hi! This is Vicky posting about her latest meal. She is extremely honored to be invited by Kirk to blog on mmm-Yoso! Hello readers! I've been a reader of mmm-Yoso for over a year now and it was probably due to this blog that I started doing Yelp.com last year. I found that maintaining a blog and doing posts took up an immense amount of time that I didn't have if I were to continually update it. So after 300 some reviews on Yelp, I'm trying out my hand at this posting dealio. I'm still getting used to this so bear with me if my pictures aren't coming out the best or if my meals don't seem that interesting. So my little cousin is visiting from UCI, I drove up there to pick him up so I could feed a hungry poor college student for the weekend and we hit up all of our local favorite joints. Being that we're both Curry lovers, we swung by Curry House tonight on Convoy Street (it's in the same plaza as Nijiya and Shanghai City). It was our psuedo-Chinese New Year's eve celebration. A little background on Curry House; they are operated by the same corporation that makes the packaged cubed curry blocks that you can find at your friendly local Japanese supermarket, but somehow, the food here just tastes a bit better. I'm guessing it is due to the fact that they have an amazing deep fryer in the back and after all, they are called Curry House. I usually order some kind of katsu or fried shrimp... something about paring the crisp panko crumbs with the smooth curry sauce. Tonight, since there was three of us, I ordered a spaghetti dish so you wouldn't get 3 different pictures of curry. Cousin H ordered the Hamburger Curry over spaghetti, H had the menchi katsu curry (one of my favs! ), and I decided to be adventurous and ordered the Tarako and Ika Spaghetti. Lunch at Curry House is usually around 2 dollars cheaper but the entrees don't come with a side choice of salad or soup. So we all got the corn potage, which in essence is Cream of Corn soup, which was silky, creamy, yet spackled with the occasional chewy kernal to balance out the texture. It's one of my favorite things on the menu, I think it goes back to my childhood when we would have corn potage on the cold nights. One this visit, we did notice a that they added a new item to their menu - Stone Pot Curry, which in essence, is a dolsot-bimbimbap but with curry sauce. S said he would be adventurous and try it out next time. So after a short wait, our entrees came out. The hamburger in the hamburger curry was nice and moist, well flavored with the occasional onion in there. In essence, it was like a meatloaf patty sitting atop a bed of spaghetti noodles. The noodles were al dente, which was a relief since I ordered a whole plate of it. I've found that asian places that offer Asian/Italian fusion tend to overcook their pasta. Thankfully the chefs back there knew what they were doing. Here's H's menchi katsu curry over rice. The menchi katsu was the hamburger/meatloaf that was breaded with panko and fried. It was rich, moist and the panko texture was great against the curry sauce.